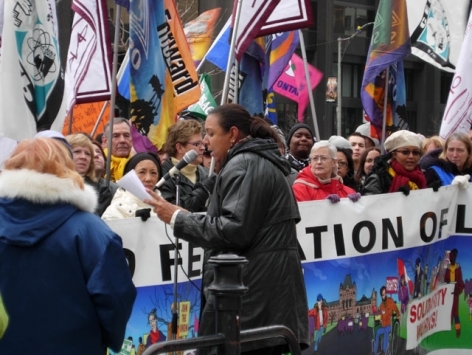 No Colombia FTA Rally: Marie Clarke Walker, representing the Canadian Labour Congress, speaks at a labour rally held in Toronto on November 29 2007 in opposition of the Canada-Colombia Free Trade Agreement. Since the Canada-Colombia Free Trade Agreement was tabled on March 26th, people across Canada have been getting the word out and showing their opposition to the deal. Popular rejection of the deal has spread far and wide, and has even reached Prime Minister Harper. "There is a view in some groups that they don’t like modern economic policy. They think you can make progress without it. They’re entitled to their view," said Harper while in Trinidad and Tobago for the the Summit of the Americas. Protest against the FTA is not limited to Canada. In Colombia, though the deal was essentially negotiated in secret, people are speaking out. "To sign this deal would not only make Canada complicit in the innumerable crimes committed by the Colombian government, which crimes have been denounced by the United Nations and the Interamerican Court of Human Rights," reads a letter sent by dozens of Colombian organizations and individuals to MPs yesterday. In the US, a Colombia solidarity organization known as Mingas has started a petition against the deal, which begins "As the global economic crisis deepens and the model of neoliberal economic development is being questioned in both Canada and the United States, it is shocking that the Canadian government would consider further entrenching these policies by ratifying this FTA." In Vancouver, friends of Colombia are planning to deliver a letter against the FTA to Michael Ignatieff at the Federal Liberal Convention on May 1st, and marches on Ottawa are planned for early May.